WATERLOO – Cree artist Kent Monkman will bring his “Urban Res Studies” exhibition, a powerful series of paintings examining the Aboriginal experience in Canada and the United States, to Wilfrid Laurier University’s Robert Langen Art Gallery March 4 – April 11. Monkman will also deliver a free public lecture as part of Aboriginal Education Week on March 4 at 4 p.m. in the Senate and Board Chamber on Laurier’s Waterloo campus. Laurier will be holding many events celebrating Aboriginal Education Week on its Waterloo and Brantford campuses, March 2-7. “Urban Res Studies” expands on Monkman’s exploration into issues surrounding the historic and contemporary Aboriginal experience. These studies, never before exhibited, provide the catalyst for the realization of dynamic, monumental paintings that carry forward Monkman’s discourse on colonization, disenfranchisement, sexuality, cultural loss and resilience. 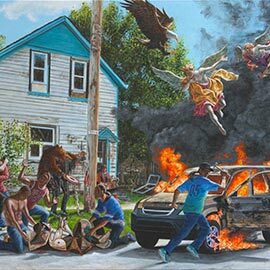 Well known for his unique interpretations of romantic North American landscapes, Monkman’s work has been exhibited around the world and is widely represented in major museums across Canada and the United States. In “Urban Res Studies,” Monkman departs from his lavish backdrops of North American landscapes inspired by the nineteenth-century works of Albert Bierstadt, and seduces viewers into the raw, dilapidated urban environment of the North End of Winnipeg. This impoverished terrain is reminiscent of inner-city neighbourhoods across North America where young Aboriginal populations have been marginalized into a revolving cycle of social dysfunction. Within this landscape, Monkman presents an eccentric cast of characters – ranging from tattooed Renaissance angels and First Nations people posing as gangbangers and protectors to historical art cameos from Pablo Picasso, Francis Bacon, and Henry Moore – which speaks directly to the cultural displacement and remix of the Indigenous experience. The exhibition catalogue features literary vignettes by award-winning author Joseph Boyden that echo the intimacy and intensity of Monkman’s paintings, as well as a critical essay by Professor Anne Brydon that speaks to the empowerment of the Aboriginal voice. Located in the John Aird Centre on Laurier’s Waterloo campus, the Robert Langen Art Gallery is open Wednesday-Saturday, noon - 5 p.m. Admission to the gallery is free of charge.